Visit the original post for full results. Yuvi, more recently, did a similar analysis based on the data he provided to me. He listed a number of findings by constrasting the two datasets including that the power users make use of both SMS txt messages (10% vs 5%) and Mobile Twitter (6% vs negligible) much more often than the typical user. He also claimed that the power users are using Twhirl less than the typical user (5% vs 7%). I believe this claim is incorrect. 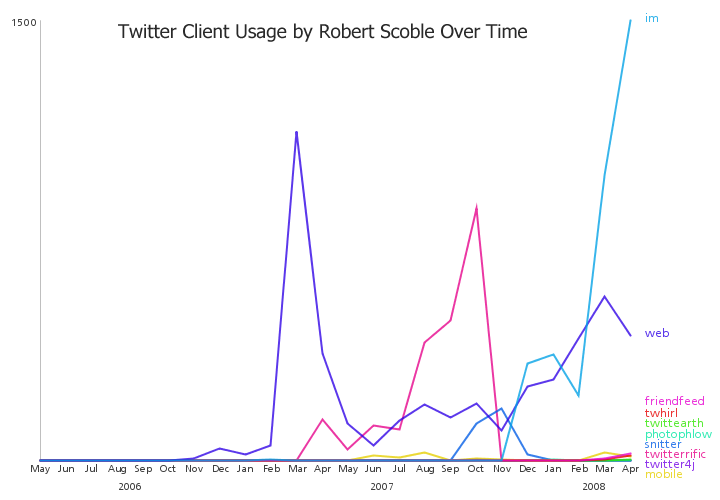 The two studies mentioned above show an average client usage over very different time periods. The ReadWriteWeb study uses data from a 24 hour period around April 2, 2008 but the StatBot analysis uses a complete list of tweets that span a timeframe from March 21st, 2006 until May 25th, 2008. Drawing comparisons between two datasets based on such vastly different time periods should be done very cautiously. Twhirl is relatively new and Yuvi's analysis used lots of historical data before Twhirl was available. The StatBot analysis showed that on average it was the 6th most popular client. 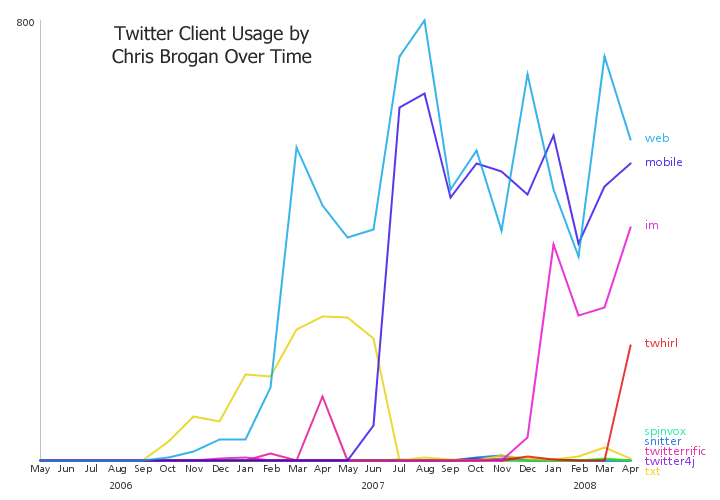 In fact, if you look at the graph above at the point between Mar and Apr 2008, which corresponds to when the 'typical user' study was done by ReadWriteWeb, you can easily see that Twhirl was actually the second most popular client for power users. I've looked at the power user data for all tweets between Mar 31st and Apr 2nd, 2008 and there were 241 for Twhirl out of 1833 total - 13% , which is much higher than the ReadWriteWeb result of 7% for typical users. 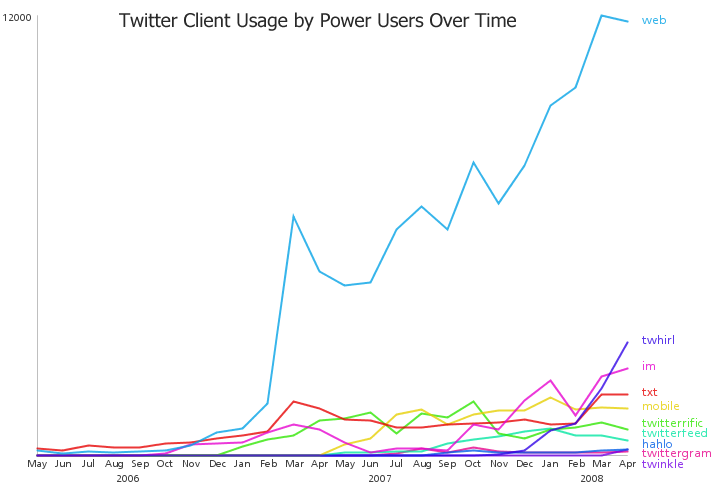 This makes sense to me - power users have more of an incentive to install a specialized client than an average user who doesn't use twitter very often.